With the stunning conclusion of Century, the top-selling third volume of The League of Extraordinary Gentlemen, creators Alan Moore and Kevin O'Neill brought their literary-crossover saga to an incredible climax. Critics called it "magnificent," a "glorious creative tapestry," and "arguably one of the greatest comics of all time." Moore and O'Neill might have been tempted to stop there and rest on their laurels... but one character, Captain Nemo's steel-hearted daughter Janni, demanded the spotlight for herself, and a spinoff was born! With a classic two-fisted spirit of adventure, the NEMO graphic novels have followed the terrifying pirate queen in her confrontations with unearthly Antarctic horrors (in Heart of Ice) and mechanical metropolitan monstrosities (in The Roses of Berlin). Now, Top Shelf Productions and Knockabout Comics present what may be the Captain's final voyage! It's 1975, and our aging heroine is beginning to display a tenuous grip on reality. Pursuing shadows from her past—or her imagination—Captain Janni Nemo steers her wondrous ship Nautilus on an obsessive journey into the tropical mysteries of the Amazon, in a last attempt to put to rest the blood-drenched spectres of old. What awaits? New allies, outrageous enemies, inscrutable youths, impossible creatures, and a truly flabbergasting final battle. 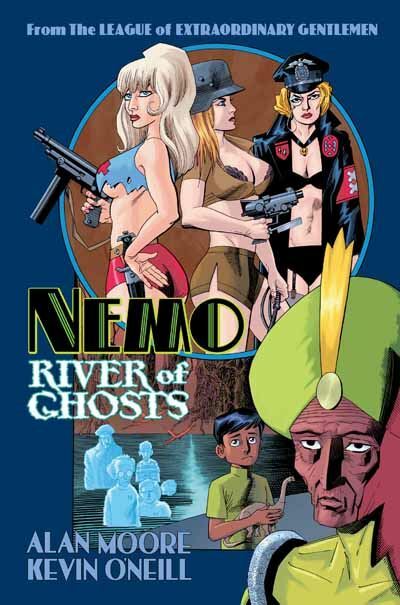 Don't miss Nemo: River of Ghosts — preorder now for release in March!